SEOUL, Jan. 15, 2012 -– LG Electronics’ (LG) glasses-free CINEMA 3D monitor, the D2500, became the world’s first glasses-free 3D monitor to be certified by UL, (Underwriters Laboratories) for product safety, strengthening LG’s leadership in the glasses-free 3D product segment. 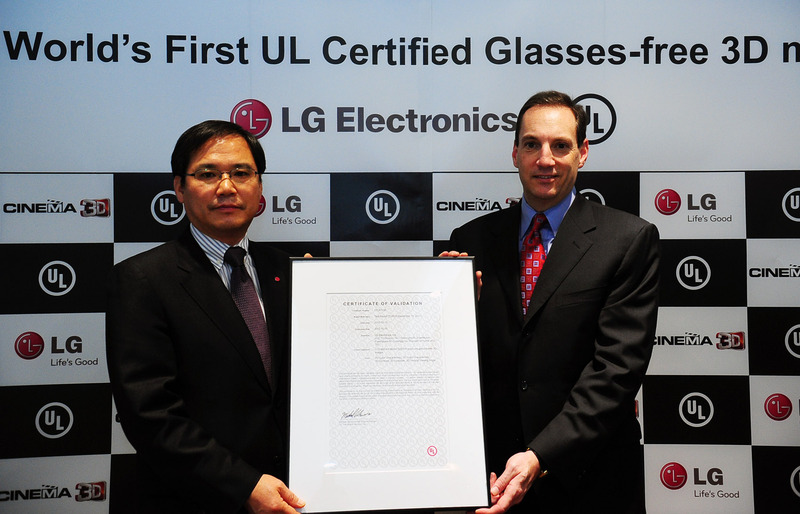 The certification was officially presented to LG at last week’s Consumer Electronics Show (CES) in Las Vegas. D2500 also received the Certificate of Validation on five different types of tests conducted by UL, including those for 2D Color Characteristic, 3D Color Characteristic, 3D Contrast, 3D Crosstalk and 3D Vertical Viewing Angle. UL is internationally renowned for its product quality and safety certifications of electronics products. The D2500 uses the Parallax Barrier technology, which creates an illusion of depth based on a series of light-blocking barriers attached to the front of the LCD panel, which ensure the left and right eyes see different images. In order to ensure optimal 3D image quality, the D2500 also uses a head-tracking technology that tracks the user’s head and eye positions in real time through the imbedded web cam, thereby adjusting 3D images in accordance with the user’s viewing angle and distance from the CINEMA 3D monitor. 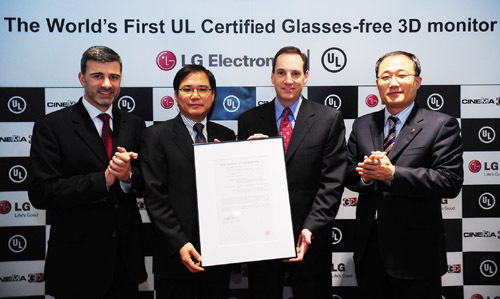 In addition to the UL certification, the D2500 has also been certified by TUV Rheinland as a glasses-free 3D product. TUV lauded the D2500 as exhibiting excellent contrast ratio and color production.